Slow boat on the Mekong | Cheer Up! Posted on October 10, 2015	by Mimi G.
The water is low. Rocks rear out of the river, telling their story of the varied levels of the river. 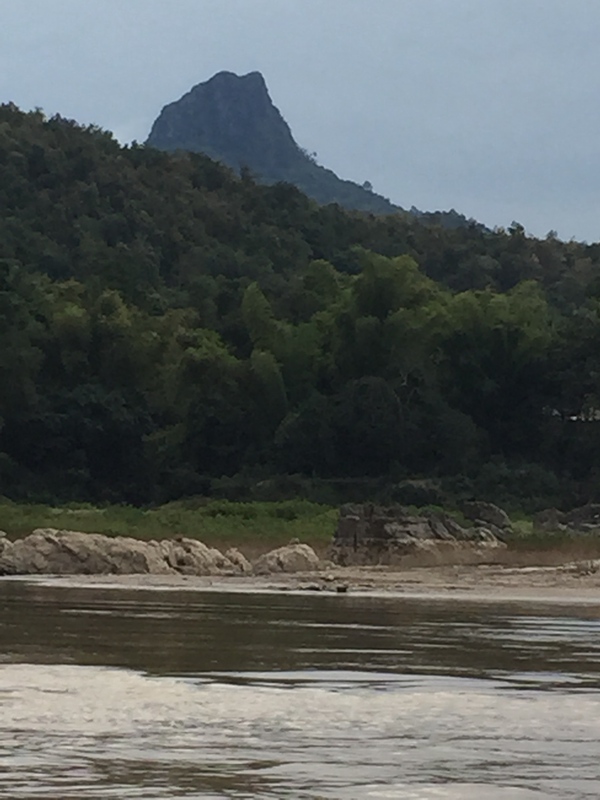 We are on a two day trip on the fabled Mekong river, from Huay Xai to Luang Prabang in Laos.The slow boat we are on is, in fact, too fast to get good shots of the rocks most of the time. It is slow only compared to the stupidly dangerous little speed boats, which occasionally pass us, a few of the passengers wearing motorcycle helmets. The air is crisp and cool, like a green apple. Here and there, a fisherman casts a net from his lonely boat into the dull brown waters. 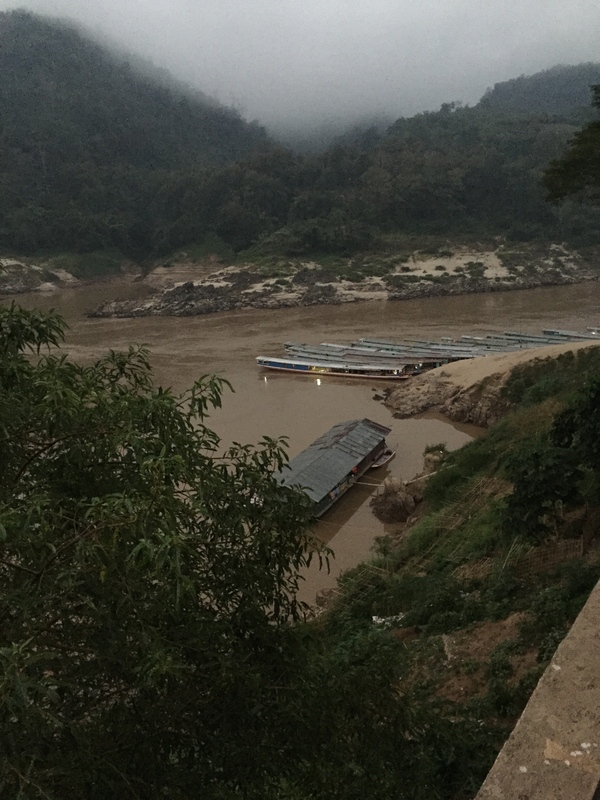 I heard the catfish in the Mekong are large enough to eat people – I wouldn’t want to fall into this river. A water buffalo on the banks scratches his long curved horn with his back hoof. The boat rides low in the water, often scraping submerged rocks. It is packed with over a hundred and twenty people. Its sides are raised, with a little wooden carved railing, but we are sitting practically at the level of the water, mildly uncomfortable in re-purposed old car seats. 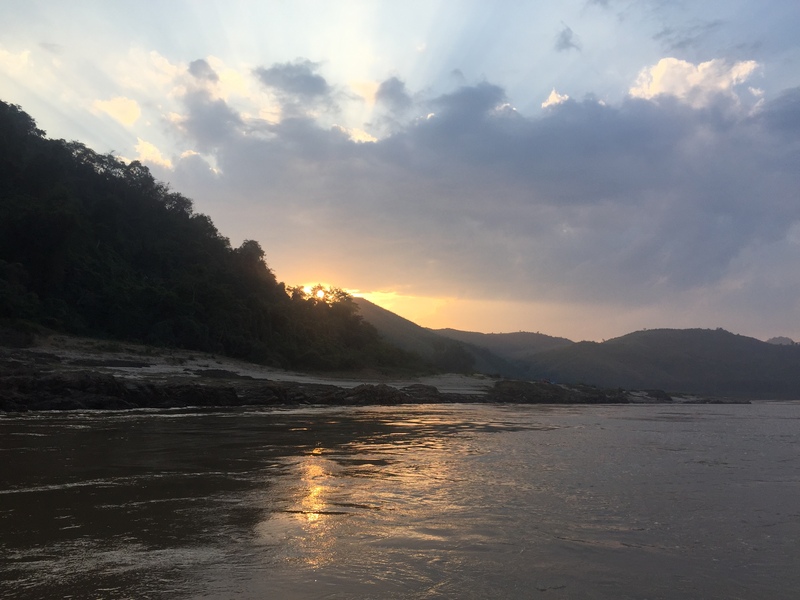 The boat will take 6 to 8 hours to reach Pak Beng, where we spend the night, and an equal time the next day to travel on to Luang Prabang. The boat leaves again at 9 am, this time a lot emptier, giving us room to stretch out. The landscape continues to unfurl – the rocks alternating with sand; the hills on both sides covered with light and dark green; the rushes standing on the shore, still as if in a painting; the thick brown water always rolling on, creating a constant sense of deja vu. The currents are fast here, the river still early in its journey — a mere hundred or so feet across. How wide does the mighty Mekong get further downstream, I wonder? I remember pencilling its course on blank world maps back in 9th grade geography. I don’t think I could do that accurately any more. The hills lining both banks creep higher and seem more unapproachable as we move further downstream. It becomes obvious why this river was the only highway in this part of the world for centuries past. I wonder about the geniuses, their names lost in the mists of time, who learnt to master the waters that course through these lands. 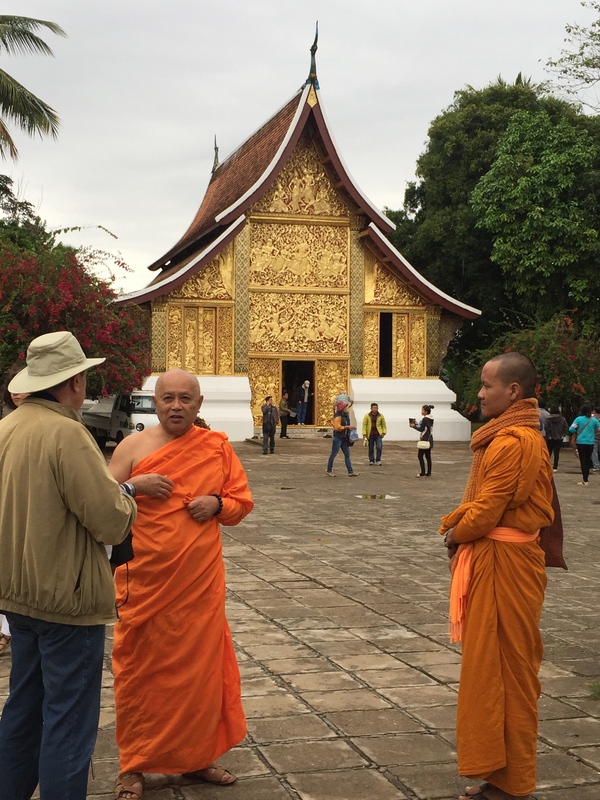 Our final destination, Luang Prabang, tucked into the hills of northern Laos, is a UNESCO heritage city of golden temples and orange-robed monks. It is achingly pretty, with a photo op around every corner. A little tourist heaven without the tourist rush — you can check out the dozens of temples, visit waterfalls, play with elephant at hillside camps, take cooking classes — all at a enjoyably relaxed pace. It is undeniably south-east Asian, with a dash of French thrown in. It does have an airport with connections to nearby convenient cities, so you don’t have to take two days to get here if you don’t want. But try not to miss that epic journey — there is nothing much else that can be compared to it. This entry was posted in Travel and tagged Asia, Laos, Mekong, Therapy. Bookmark the permalink.